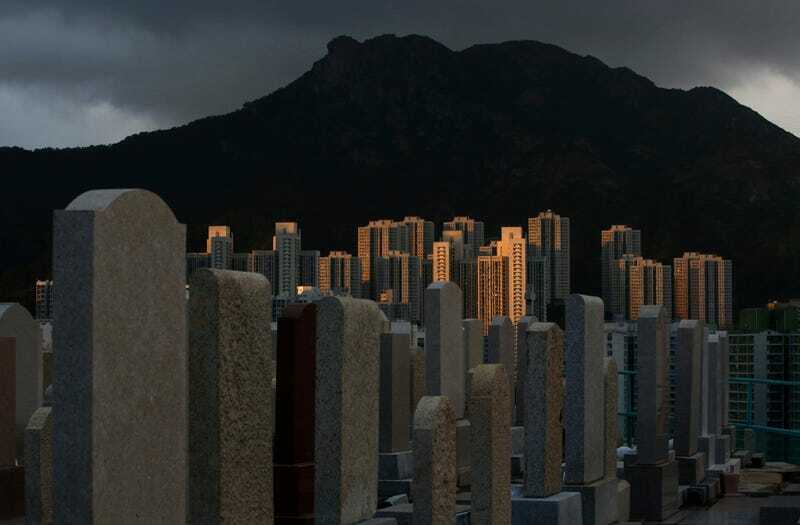 Hong Kong is one of the densest cities in the world: Because it’s confined to a coastal archipelago, it’s been running out of space for centuries, including the square footage needed for new burial sites. Throughout the city, cemeteries and burial vaults are so full you might wait years to secure the rights to a tiny niche inside a columbarium–the buildings in which hundreds of thousands of such niches store the ashes of the deceased and create a memorial for the living to visit. A photo essay by the AP’s Kin Cheung this weekend put the spotlight on the problem, especially as the government tries to alleviate the problem with new columbaria. Some of these proposed structures are creating tension between the developers and locals, who point out that they pollution on holidays when relatives visit their loved ones’ niches to burn offerings. Columbaria are common throughout the world, especially in countries where cremation is the conventional form of burial, and they’ve gotten higher-tech over the years—like the one below, in Tokyo, where visitors use a special access card to gain entrance and programmed lighting highlights specific niches. One columbarium proposed in Hong Kong this year would use similarly high-tech details to create a space for loved ones to remember the deceased inside an existing piece of infrastructure. It’s called the Island Memorial Centre. This planned columbarium, which the AP says faces a fair amount of public opposition, is actually being planned by a freight and logistics operator called Kerry Logistics. This year, the company proposed turning one of its warehouses–which seems to be located at 50 Ka Yip Street, according to planning documents and meeting minutes–into a huge, high-tech columbarium filled with as many at 100,000 niches. The warehouse today, which someday may become a 15-story columbarium. First of all, the columbarium will look like an ordinary commercial building. And instead of the place being filled with the usual black-and-white pictures of the departed, the facility will make use of electronic screens to show the images which visitors can turn on and off. William Ma Wing-kai, executive director of Kerry Logistics, said cameras will be installed in front of the columbarium niches, allowing people to pay homage to their deceased loved ones through the use of a smartphone. The group will also arrange for ferries to transport visitors to and from the columbarium during the tomb-sweeping peak season to ease the traffic pressure. The current warehouse is reportedly not close enough to a port to make is valuable as a logistics hub—but as a memorial site is could be very, very lucrative. The Journal of Commerce estimates that if Kerry sells each niche at $9,000 a pop (the market going-rate), the company could make a 70 percent profit. “It is one of the Group’s long-term initiatives to enhance efficiency and productivity, thereby unlocking the values of its assets and improving its return,” the company wrote in an investor relations report last year. In other words, getting into the columbarium business is a smart long-term business move for the company. But the road from warehouse to burial site hasn’t been easy, as both the AP and the South China Morning Post report, with locals rallying against the proposal based on the increase in traffic and pollution. Last month, Kerry unveiled a downsized version with only 80,000 burial niches, instead. It’s still unclear whether the project will even get the go-ahead. The problems of Hong Kong are a concentrated version of those confronting other cities throughout the world. Burying the dead is a ritual that’s been around nearly as long as civilization. But up until the past few years, the amount of space needed to bury our dead has never been a problem. Why is it only emerging now? Well, for one thing, because the majority of the world’s population began moving into cities 200 years ago, and it hasn’t let up since. As modern cities have grown, real estate has gotten more valuable, and there’s simply no economic impetus for using any of it for low-income programs like cemeteries. Then there’s the fact that the largest generation in US history is aging–and looking to secure their own burial plots. Different countries have dealt with the problem in different ways: Some remove remains once they’ve decomposed and re-use the plots, as the BBC reported. In the UK, there’s a debate emerging over whether grave sites should be “leased” for a limited amount of time. In Norway, the problem has been exacerbated by the fact that bodies aren’t decomposing at all, due to a plastic covering commonly used to wrap the deceased. In 2013, the New York Times hosted an online op-ed debate about what should be done. Natural burials, “woodland” cemeteries, and other alternatives were all proposed. In Hong Kong, this ubiquitous problem is leading to the re-appropriation of industrial infrastructure, like Kerry’s warehouse proposal. In an odd way, the project parallels the gentrification of post-industrial waterfront neighborhoods all over the globe–in life or death, skyrocketing real estate prices are changing the face of our cities.